WHO WAS ANNE FRANK? — STRONG. The diarist Anne Frank was born on this day in 1929. In our blog today, we go back to issue 2 to find out more about the young girl who, through her writing, has helped generations of us understand the true horror and impact of the Holocaust. Anne Frank said herself "How wonderful it is that nobody need wait a single moment before starting to improve the world." She showed us all that we all have a voice, and that just one person can make a difference. 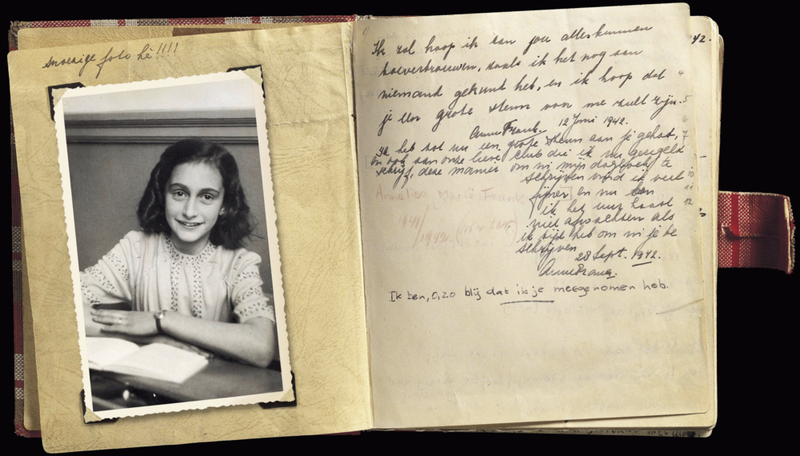 Anne Frank’s Diary was first published in 1947, two years after the end of the Second World War. It is the journal of a young Jewish girl living in Amsterdam, in the Netherlands, during the German occupation. Anne received her diary, which she named Kitty, on June 12, 1942. It was a gift from her parents for her 13th birthday. Anne had been born in Frankfurt, Germany, in 1929 but had fled with her family to Amsterdam in the Netherlands at just four years old when the Nazi party had gained control of Germany. Things were to get worse and the Frank family made plans to go into hiding. On July 6, 1942, after Anne’s 16-year-old sister, Margot, received an instruction to report to a work camp, the Franks brought their plans forward and made their way to what was to become their home for the next two years. The family had to be careful to black out the windows and move around quietly so that workers downstairs would not know they were there. The Frank family was joined by another family, The Van Daans, on July 13. They had a 16-year-old son called Peter. Anne was unimpressed by Peter when the families first went into the annex, but in her diary she wrote about how she fell in love with him a year and a half later. Throughout her two years in the annex, Anne detailed the day-to-day goings on and the fallings out between inhabitants as they struggled to cope with their cramped living conditions. Apart from the news their helpers brought, and a radio, they were completely cut off from the outside world. In such a confined space they were frequently bored and hungry, and they lived in fear that any day they could be captured. Anne wrote in her diary about the progress of the war from the news the families heard on the radio. She also analyzed the different personalities of the people she was living with. She wrote that she wished to become a journalist when she was older. The families and their helpers were arrested on August 4, 1944, when the Gestapo (The Nazi secret police) stormed into the annex. The Frank family was taken to Auschwitz, a concentration camp in Poland. There the men and women were separated. Otto Frank, Anne's father, never saw his family again. In October 1945, Anne and Margot were transferred to a different camp, Bergen Belson. Edith Frank was sick and stayed in Auschwitz, where she died. Anne and Margot are both believed to have died in February or March of 1945 from typhus. Otto Frank was the only member of the Frank family to survive. After the war he returned to the Netherlands where one of his helpers had found Anne’s diary scattered on the floor of the annex. “I want to go on living even after my death,” Anne wrote. She does. Today her diary, that of an ordinary 13-year-old girl living in extraordinary times, is one of the most famous books in the world. It has been translated into over 60 different languages and serves as an essential reminder of a terrible time in our history. Newer PostSAY HELLO TO YOUR NEW STRONG GIRL PRESENTERS!